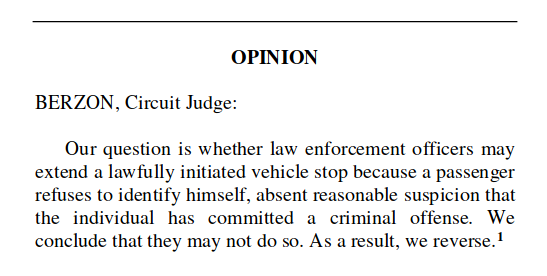 9th Circuit: Passengers in a car don’t have to identify themselves | Papers, Please! 9th Circuit: Passengers in a car don’t have to identify themselves – Papers, Please! Landeros was arrested … for “failure to provide his true full name and refusal to comply with directions of police officers.” See Ariz. Rev. Stat. Ann. § 13- 2412(A) (“It is unlawful for a person, after being advised that the person’s refusal to answer is unlawful, to fail or refuse to state the person’s true full name on request of a peace officer who has lawfully detained the person based on reasonable suspicion that the person has committed, is committing or is about to commit a crime.”); id. § 28- 622(A) (“A person shall not willfully fail or refuse to comply with any lawful order or direction of a police officer invested by law with authority to direct, control or regulate traffic.”). These Arizona laws are similar, as the 9th Circuit panel noted, to the Nevada laws at issue in Hiibel. Arizona Law provides that “[a] person shall not willfully fail or refuse to comply with any lawful order or direction of a police officer invested by law with authority to direct, control or regulate traffic.” Ariz. Rev. Stat. Ann. § 28-622(A). The question that remains, then, is whether law enforcement could lawfully order Landeros to identify himself, absent reasonable suspicion that he had committed an offense. In its opinion, the Court distinguished the circumstances of Hiibel’s arrest from those of an earlier case, Brown v. Texas , 443 U.S. 47 (1979). Brown overturned a conviction under a Texas “stop and identify” law similar to that at issue in Hiibel . Id . at 49–50. Unlike Hiibel, Brown was stopped, detained, and interrogated about his identity even though there was no reasonable suspicion that he had committed any offense. Id . at 51–52; see also Hiibel , 542 U.S. at 184 (discussing Brown ). Brown held squarely that law enforcement may not require a person to furnish identification if not reasonably suspected of any criminal conduct. Brown , 443 U.S. at 52–53. In short, Brown holds that an officer may not lawfully order a person to identify herself absent particularized suspicion that she has engaged, is engaging, or is about to engage in criminal activity, and Hiibel does not hold to the contrary. As explained above, the officers insisted several times that Landeros identify himself after he initially refused, and detained him while making those demands. At the time they did so, the officers had no reasonable suspicion that Landeros had committed an offense. Accordingly, the police could not lawfully order him to identify himself. His repeated refusal to do so thus did not, as the government claims, constitute a failure to comply with an officer’s lawful order, Ariz. Rev. Stat. Ann. § 28- 622(A). There was therefore no justification for the extension of the detention to allow the officers to press Landeros further for his identity. The government repeatedly notes that this court’s precedent permits police to “ask people [including passengers in cars] who have legitimately been stopped for identification without conducting a Fourth Amendment search or seizure.” United States v. Diaz-Castaneda, 494 F.3d 1146, 1152 (9th Cir. 2007) (emphasis added). But we need not resolve whether that precedent remains valid…. Regardless of whether the first request for Landeros’s identification was lawful, law enforcement’s refusal to take “no” for an answer was not. Diaz-Castaneda does not suggest otherwise. The government also contends that Landeros’s refusal to identify himself “provided reasonable suspicion of the additional offenses of failure to provide identification and failure to comply with law enforcement orders.” Arizona law provides: “It is unlawful for a person, after being advised that the person’s refusal to answer is unlawful, to fail or refuse to state the person’s true full name on request of a peace officer who has lawfully detained the person based on reasonable suspicion that the person has committed, is committing or is about to commit a crime.” Ariz. Rev. Stat. Ann. § 13 -2412(A). By the plain text of the statute, Landeros could not have violated Section 13- 2412 because, as already explained, the officers lacked reasonable suspicion, at the time they initially insisted he identify himself, that Landeros had committed, was committing, or was about to commit any crimes. Where does this leave the law in the 9th Circuit with respect to a demand for ID made by police to a person who isn’t operating a motor vehicle that requires a driver’s license? Then you can be required to verbally identify yourself to police (“My name is Jane Doe”). It’s important to note that neither the Supreme Court in Hiibel v. Nevada, nor the 9th Circuit in US v. Landeros, reached the question of when, if ever, a pedestrian or passenger in a car, as distinct from a driver required to have a license to operate a motor vehicle, can be required to show ID, even if they happen to have an ID card or other evidence of identity on their person or in their possession. The Court did not mention that the officer’s request for “identification,” which it understood as “a request to produce a driver’s license or some other form of written identification,” id. at 181, demanded more than state law required Hiibel to provide. We supported Dudley Hiibel, and we continue to think that Hiibel v. Nevada was wrongly decided. But we welcome the 9th Circuit’s recognition of the Hiibel decision’s limits.